Step 1 Cook the corn kernels in 2 teaspoons oil in a small saute pan for 2 to 3 minutes on low heat until crisp-tender. Season with salt and pepper; place in a small bowl and chill. Step 2 Remove the sinew from the fish and cut the meat into small dice. Step 3Combine the lime and tangerine juices with salt and pepper to taste, then whisk in the remaining 3/4 cup olive oil. Marinate the fish in this mixture for 3 to 5 minutes. Step 4Combine the marinated fish with the chilled corn and the cucumber, radish and chopped cilantro. Season with salt and pepper to taste. Step 5To serve, place 2 lettuce leaves on each salad plate. Spoon some of the juices onto the leaves. Using a slotted spoon, mound the ceviche onto each plate. Garnish with cilantro. In Recipes-list.com we have selected the most viewed recipes from category - Appetizers Fish and shellfish Healthy eating Main courses Salads . Enjoy the best recipes specially selected for you! 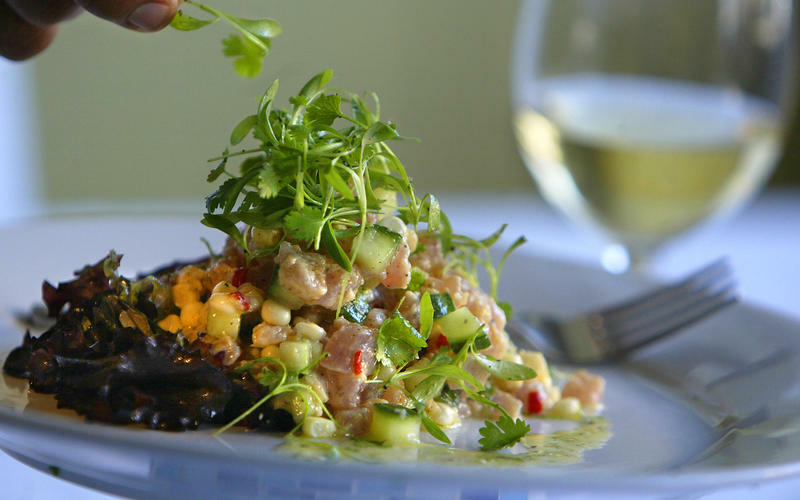 Albacore ceviche salad is the right choice that will satisfy all your claims.